Harbortouch, a leading national point-of-sale (POS) system provider, recently announced the launch of a new premium POS solution for the foodservice industry: Harbortouch Bar & Restaurant (HBR). After deploying and supporting POS systems in the bar and restaurant markets for over a decade, Harbortouch has taken its extensive experience supporting tens of thousands of businesses in this vertical to build a brand-new software platform from the ground up that offers a vastly superior solution for this industry. HBR includes all of the features and functionality that restaurateurs would expect from a premium POS solution, along with many innovative new additions such as keyword tags for easy item grouping and searching. The software interface has been designed for intuitive and efficient operation, with a minimal number of touches to accomplish the most common tasks. Since HBR is built on the Android platform and features hybrid-cloud architecture, the software adapts easily to both traditional POS workstations and mobile tablet solutions. In addition to the core software, various value-added modules are available such as tableside ordering via tablet, online ordering and online reservations. The software is connected to the cloud for remote reporting and POS management through the company’s powerful Lighthouse portal. Later this year, Harbortouch plans to roll out Lighthouse 5.0 which will incorporate a number of dramatic enhancements for HBR customers, including social media management, the ability to respond to online reviews on sites like Yelp and TripAdvisor, and a new POS Marketplace where businesses can access third-party apps that will integrate directly with their Harbortouch POS system, adding additional tools such as loyalty programs, payroll, accounting software and more. This cloud capability also enables the company to remotely deploy software updates on a regular basis to ensure a future-proof POS solution for years to come. 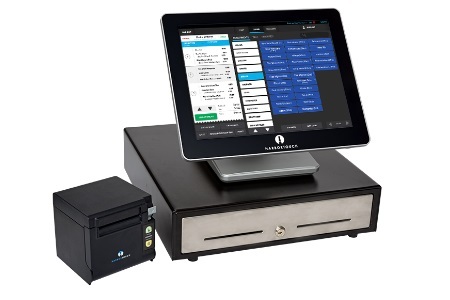 With Harbortouch’s unique POS-as-a-Service business model, businesses can obtain a best-in-class POS system with no up-front costs, including state-of-the-art hardware, premium software, custom programming, professional installation, onsite training and 24/7 support, all for $49/month. Harbortouch is a leading business technology company and pioneer of the POS-as-a-Service business model, having served over 300,000 merchants in 18 years in business and currently processing more than $17B annually. The company offers a revolutionary free equipment program that delivers best-in-class POS systems with no up-front costs, including state-of-the-art hardware, premium software, custom programming, professional installation, onsite training and 24/7 support. A six-time Inc. 500/5000 honoree and recipient of numerous industry awards, Harbortouch has been widely recognized for its innovative and disruptive POS and payment solutions. For more information, visit www.harbortouch.com.